The beautiful reflections of the christmas tree on the water featured outside Caesars Palace in Las Vegas, Nevada. Caesars Palace in Las Vegas, Nevada is one of the most elegant hotels along the strip especially when it is adorned with Christmas decorations for the holiday season. The magnificent fountain and pond outside of Caesars Palace is gorgeous as the lights from the Christmas trees reflect images in the water that embellish your stroll along the walkway to the hotel. Las Vegas is full of fun and excitement throughout the year but around Christmas, the festivities and decorations make you feel like you are in a world of make believe.Caesars Palace Las Vegas Resort Hotel and Casino, Vegas Strip, Las Vegas, Nevada, USA, North America. 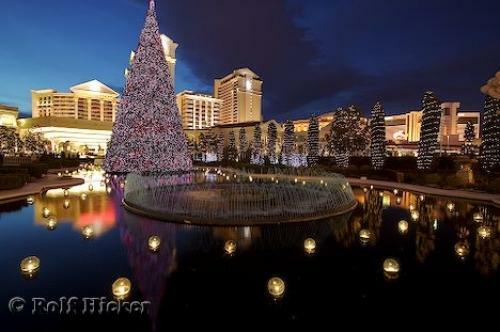 Photo of Caesars Place in Las Vegas, Nevada ready for Christmas with images of decorations reflecting off the water.